A Video: Even Monkeys Would Get Climate Change Justice. Why Don’t Governments and the Press? Many of the positions taken by some governments and individuals on climate change are so obviously unjust and unfair, that monkeys would get the injustice this video argues. Monkeys are believed to be capable of responding to obvious unfairness as this video demonstrates when one monkey is given a cucumber (which monkeys don’t like that much) and another is give a grape (which some monkeys love). The monkey who gets the cucumber throws it back at the trainer when the monkey sees the other monkey getting a beloved grape. The more serious point of this video is that those who desire to see that ethics and justice become more influential in climate change policy formation need to help others spot the injustice of actual positions being taken by governments and others on climate change policy issues rather than focus on perfect justice. Many positions of governments on climate change fail to pass minimum ethical scrutiny yet ethics and justice issues are largely being ignored in discussions of climate change policies at least in the United States. Although there is a growing literature on the ethical dimensions of climate change, most of this literature is focused on theoretical ethical questions rather than on the injustice of positions actually being taken about climate policies. 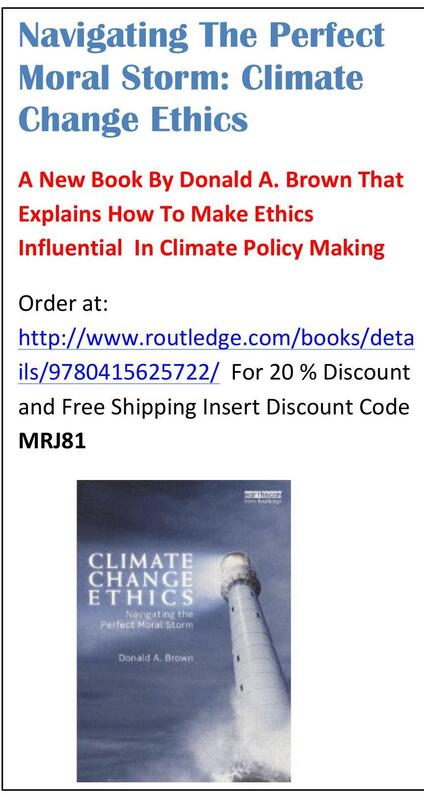 A new book, Navigating the Perfect Moral Storm, Climate Change Ethics, explains these matters in more detail and makes recommendations about how to give ethical consideration in climate change policy formation. The purpose of this video is to encourage the press, NGOs, and concerned citizens around the world to turn up the volume on the ethical dimensions of climate change. Despite a thirty-five year debate on climate change, for the most part, governments, NGOs, organizations, and individuals are ignoring the ethical dimensions of climate change even though an increased focus on ethics and justice is needed to move the world to a global solution to this immense threat. The video argues that ethics is the crucial missing element in the climate change debate and if an ethical framing of most climate change policy issues were taken seriously it would transform how the public debate on climate change takes place.